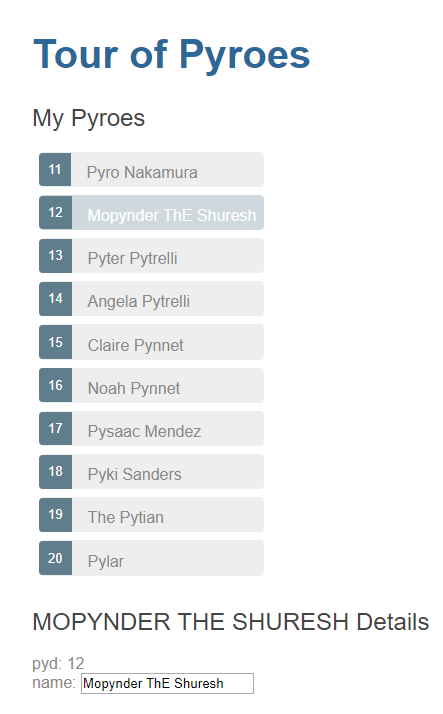 Our List of Pyroes can be displayed and individual Pyroes can be edited, but it is all an amalgam. Since we are already doing it with our main application component, AppComponent, and the listing component, PyroesComponent and how it is better done when creating large applications, we can separate the listing and editing functionalities. 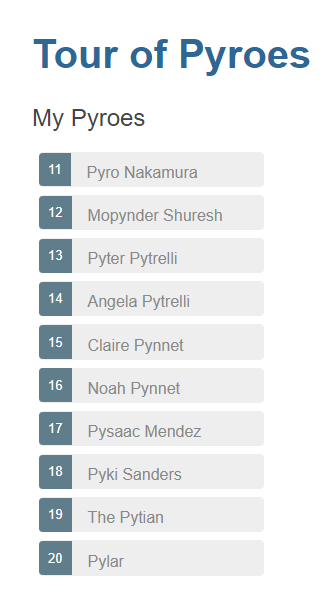 We’ll now move the details part from the html content of PyroesComponent to the html content of PyroDetailComponent. Both html files. This is where the PyroDetailComponent will be auto-rendered. The html in pyro_detail_component.html still references the observable selected_. Recall that this was defined in PyroesComponent and in fact: it will still be. As mentioned above, the observable selected_ is defined as a binding in PyroesComponent. It is nowhere to be seen in PyroDetailComponent, but the associated html content uses it. A Master-Child or Parent-Child or Component-SubComponent relationship is responsible. 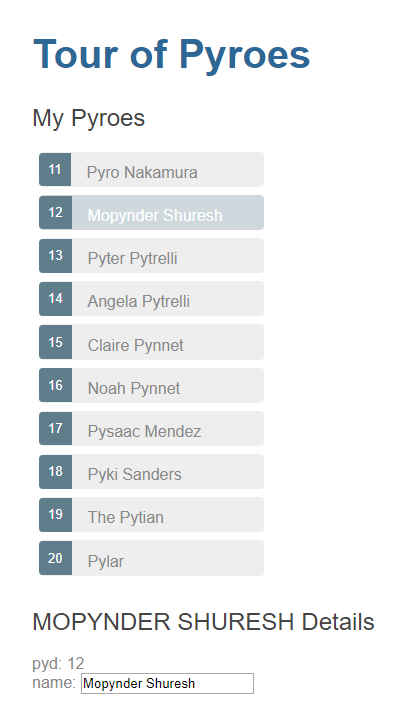 The <pyro-detail> tag and the selector = 'pyro-detail' are the keys. Because it happens inside the html code for PyroesComponent, when the associated component for the tag is instantiated (namely PyroDetailComponent) it will become a child of the component in which is being created. Being a child, it can access the bindings from the parent. Hence the capability to use the selected_ observable. PyroDetailComponent needs to be imported somewhere. It can be done in this module or it could for example be done in app_component.py or even in pyroes_component.py: the choice is yours. But if not imported: it will be just a file being idle in your file structure. Importing it, makes the component be part of the arsenal you can use in your app. We haven’t changed the functionality, simply how we distribute the functionality across components. The results are the same as in the previous example. Now that things have been broken down in different components, we can move on.